The new edition of this two volume set has been fully revised to provide dermatosurgeons with the latest developments and techniques in the field. 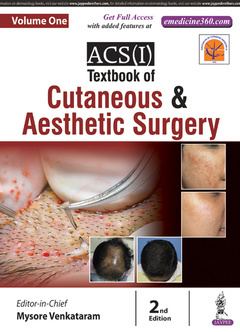 The book has been expanded to eighteen sections and 152 chapters, all falling under subspecialties of dermatosurgery, aesthetics, lasers, and practice management. Each technique includes discussion on historical background, indications, contraindications, instrumentation, procedures, adverse effects, complications, and references. The second edition features 81 new chapters on topics such as body shaping, microneedle RF, new laser and energy technologies, platelets rich plasma, regional surgeries, and training in dermatosurgery. The text is enhanced by nearly 2000 clinical photographs and diagrams and also includes text boxes, tables and keynotes in each chapter.